Sophie from Sophie Honeysuckle said that she wanted to see people's beds. Everyone (including Sophie) have probably seen my bed before, but here it is again. 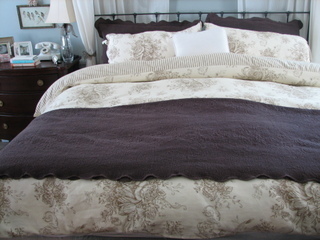 Not sure if you can tell, but the accents (the toile, the coverlet and shams) are brown, with the duck egg blue. I really love the combination. The phone is from Pottery Barn. I thought it looked sort of French 1930's. 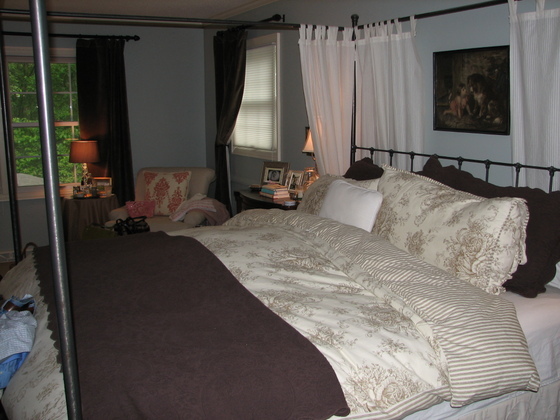 The bed is from Room and Board and is a four poster bed (these pictures don't really show that). This is one of the bookcases in our living room. 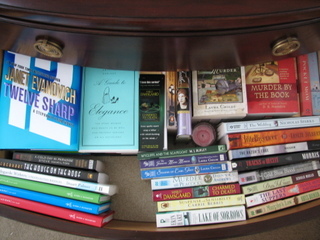 The other bookcase is filled with my mystery stuff. I started organizing my magazines in this bookcase because they were all over the place. I tried to organize them in stacks, but all I got were a bunch of stacks - stacks on the floor, stacks on tables, or any surface that was handy. Now that they are in the bookcase they are so much easier to find, and they look so much better. 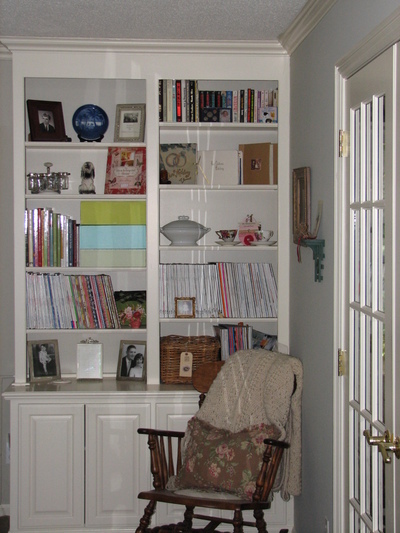 Especially the Country Home magazines - love the the colors and patterns they use for the binding. The rocking chair is one my grandma refinished. She also made the needle point seat that is barely visible. The bottles and little stand are from a post office - the stand use to have stampers hanging from it. I put individual flowers into the bottles sometimes. 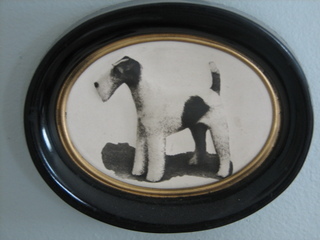 The chalk dog is one I got with my mom in Buffalo on an antiquing excursion. The colorful boxes hold greeting cards for every occasion. It's very handy to have cards around - and I love the colors and organization of the boxes. You can see the Country Home mags on the lower right - love all the colors. 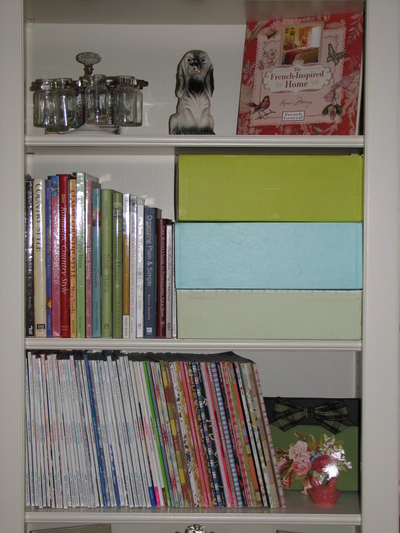 Many of you have probably seen this picture too, but I thought I would include it since I showed the other bookcase. The bookcases are on either side of a window in the LR and are mirror images of each other except that they are filled with completely different things. 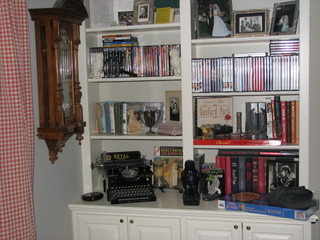 Displayed are all of my mystery DVD's, some of my Nancy Drew books, mystery games, old typewriter, magnifying glasses, old flashlight, Maltese Falcon replica, 1930's picture of Basil Rathbone playing Sherlock Holmes, and of course my deerstalker hat. You all have been so great to me with your many positive comments regarding my job change. I wanted to report back that I absolutely love my new job. My team is so great, very top notch. And my manager is wonderful. The change has been so dramatic that I sometimes can't believe that I didn't do something about it sooner. But, good or bad, we do get stuck in our routines, afraid of change because what if that change brings something worse. I happily get up every day for work now, and no longer have the "Sunday blues". So for anyone out there contemplating a job change, it just might be your best move yet. For me, stress has now been replaced with excitement. My commute is an hour less every day - that's approximately 240 hours a year of my life that I just got back. No longer do I have to think about laying off members of my staff and all the many other unpleasant things I had to do every day at work. We just bought a new laptop for home so you will be seeing more of me. Blogging in the basement wasn't fun - I always felt I was missing out on something upstairs, and as a result, wasn't posting as often or visiting you as often. Now I can blog outside, in the kitchen, in the bedroom - where ever the mood strikes me. Much more convenient. Thank you all for the visits - best wishes to you!! I had to step onto the wooden trunk in the living room to get this aerial shot of the ironstone platter with vintage buttons. Either that or I'm very tall - but it's one of those two possibilities. 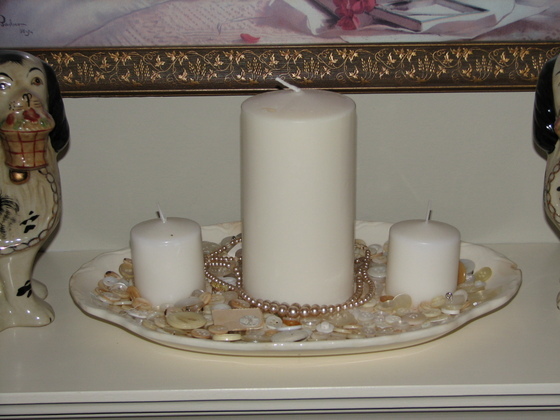 I found the platter and buttons on a recent antiquing trip and thought it would be cute to put the buttons on the platter and add a few candles. My mom and I used some of the buttons for our sewing projects. The below picture may look familiar if you saw this post. I swapped out the green bowl for a very old egg basket that I found when I was antiquing with my mom. 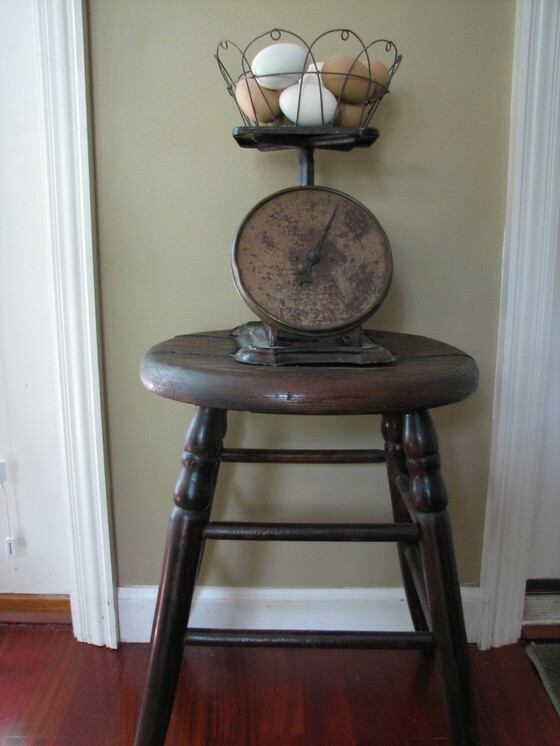 I have always liked old egg baskets and I especially loved this one and its simplicity. The green bowl now houses cookie cutters in my display cabinet above the sink. The below is in our master bathroom. 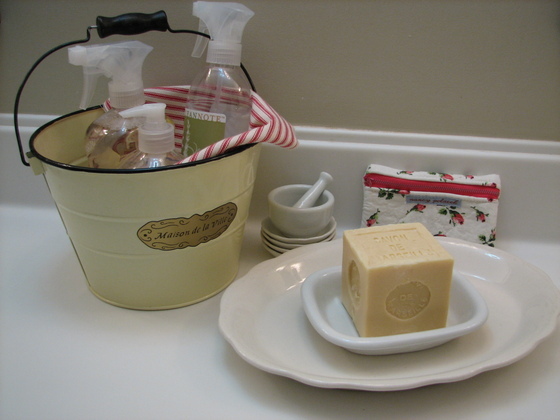 The little French bucket holds our lavender cleaning products and lavender linen spray. The soap is Savon De Marseilles - I love the blockiness of these soaps. The little flowered bag was made by a local woman in the Twin Cities. I hope you are all having a safe and wonderful weekend my friends :o) I'm about to make some coffee in our new pretty coffee maker...sometimes I just like to stare at it. Some of you have probably seen another picture like this that I took a few months ago, but I thought I would take another as I was snapping photos around the room. That wall across the room is screaming for a picture. It is so obviously bare, like a beacon flashing at me. Hey, how'd those clothes of Steve's get in the picture? Oh yeah, because I moved them from the spot they had been when I was trying to take an earlier picture - they're kind of like a fixture...piles of clothes (Steve's that is...see, I like to keep my piles of clothes discretely hidden from view in my closet with the door shut). It seems my strategic attempts at getting the clothes out of the way ultimately failed when I had moved them so many times that I ended up forgetting about them. That's what I get for trying to pretend that we don't have messes - hah! Do you see that little matchbox on the left - with the drawing of a woman's face, and a little hat and veil? Isn't she cute - it's old, was my grandmother's. 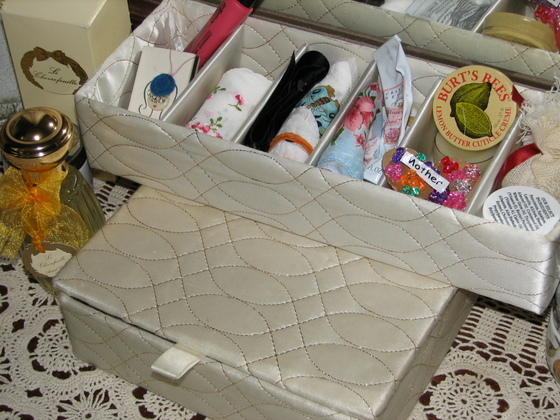 In the box with the lid and the open box with dividers, I have many handkerchiefs of my grandmother's and great grandmother's. I really enjoy the different patterns, colors, and embroidery. Can't even imagine blowing my nose on them...yuck...and then stuffing in my purse...double yuck...but perhaps a slight daubing of a glistening eye at a wedding - that wouldn't be as bad. The "Mother" pin was made by Evy for Mother's Day this year. To the left is my new Annick Goutal 'Le Chevrefeuille' perfume, which was recommended to me by Sophie. I REALLY like it and reminds me a bit of my Kate Spade perfume that I love so much. My mom and I have been having a lot of fun. We've been working on sewing projects (the projects will be in my next post), watching mysteries, looking through loads of decorating magazines and decorating books, and of course playing with Evy. 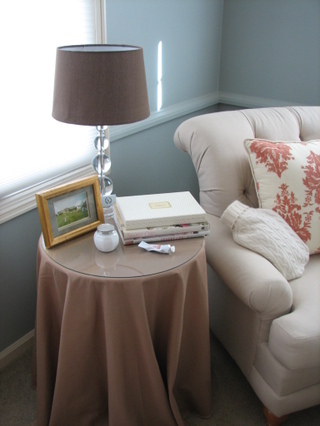 I just wanted to pop in and say hi, and leave a picture of the little table that sits next to our chair and ottoman in our bedroom. 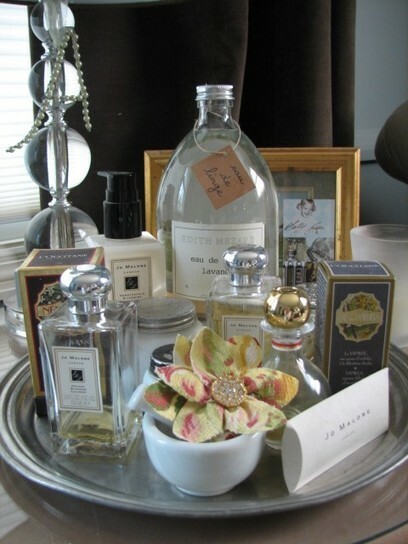 I really like the arrangement on the table, especially with the silver tray of perfumes and old bottles, the lucite-esque lamp (it is actually from Target so it isn't lucite), and the gold frame. I also like the way that the silver, gold and "lucite" work together - it mixes well even though they are all different. 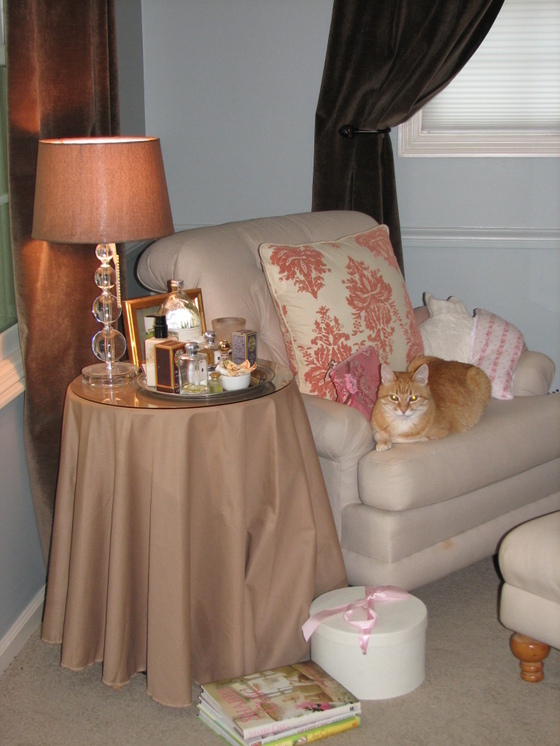 In the background are the new chocolate brown velvet curtains. They are from Restoration Hardware. There are a few perfumes that I really love and typically wear one of them every day. Most are on this tray. Burberry (not shown), Jo Malone (I have two: one is Orange Blossom, the other is Honeysuckle and Jasmine), Kate Spade, and L'Occitane (one is Vanilla, the other is Neroli). The flower is a lapel pin made of vintage fabric and a vintage piece of jewelry. I usually get one every time my mom and I go to one particular antiques occassional sale in Buffalo, MN. I have four different ones now. In my next post I will show you the great sewing projects that my mom and I did. We made cosmetic bags, small change purses, and a beautiful liner for a picnic basket I have. Hope you are all doing very well - I've been thinking of you. I hope everyone is having a really nice weekend. I just finished watching "Barbie and the Magic of Pegasus" movie with Evy, so I think that speaks for itself. And I do mean that in a good way...I liked "The Twelve Dancing Princesses" okay, but the Magic Pegasus movie was loads more entertaining. Okay, well, disturbing additional details about Allison's life you probably could have done without knowing. At any rate, I'll just say the movie didn't burn out my retinas or anything, and the rods and cones are also still intact. 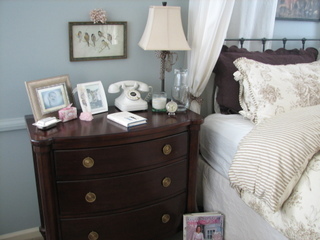 I mentioned yesterday I would post some pictures from our bedroom. Let me just add that as I took these pictures I was moving piles of laundry, books, and a significant amount of "Evy" stuff that seems to always end up in our room. Before I could take a picture I'd have to move the stuff to one spot, take the picture, and then move it again to another spot so that I could take another picture. It did get me to clean it up though in the end because I was so annoyed with myself that there was such a pile of stuff. Please let someone out there be in the same boat. I love this little bird picture. 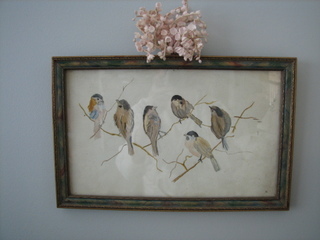 It's a water color that I found at an antique show last spring. And I love that old flower corsage - must be from the 40's maybe. I got it in Idaho when I was visiting my mom. 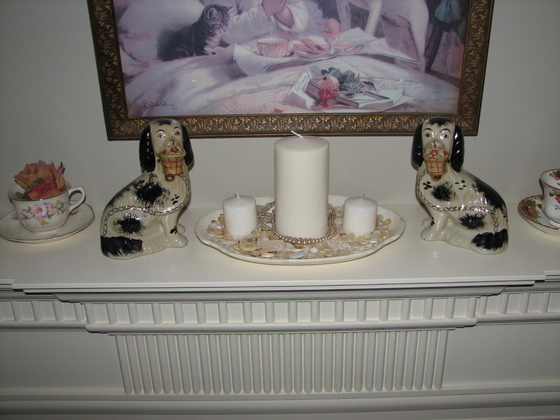 There is a little shop called Shabby-to-Chic Shoppe. So cute. 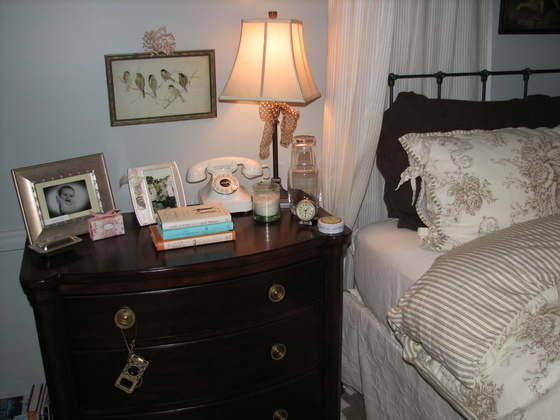 Reading nook in bedroom. That little thing that looks like it has a turtle neck sweater on is a hot water bottle with a cashmere sweater cover. I got it for my birthday a few years ago from my cousin and it is wonderful. Really so great for warming the bed and if you have a stomach ache. This little fella is only about 5 inches across and about 3 or so inches tall. Isn't he cute! I got him in Idaho - same trip as the above flower corsage. I love vintage dog prints and bird prints. If I see one I pretty much have to get it. Can't help it. Okay, last picture. I just wanted to show another cute vintage animal print. These are in Evy's room. 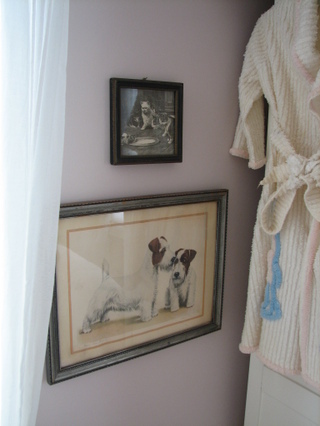 Hanging next to them is a vintage child's bathrobe with little bunnies in blue. You probably can't see the bunnies very well, but the bit of blue chenille is one of the two bunnies.